Powered mobile storage systems allow traditional pallet racking to move electronically, making the most of the potential storage space available. The pallet racking or shelving is fixed to motorised bases, with wheels, that can be easily moved along the floor. This allows for stock to be condensed, which enhances the overall storage capacity of the area. To retrieve the stock, the required racks can simply be moved to allow easy access via forklift, ensuring an efficient flow of stock and accurate stock keeping. 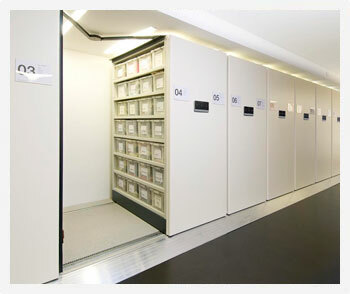 Here at Stodec Products, our design and installation services can provide a bespoke mobile storage system that will fulfil all your operation and budget requirements. To find out more, or arrange a site survey simply get in touch today. Our Mobile Racking system is the ultimate solution for high density storage of all pallet sizes or goods that need to be stored. The design eliminates the need for multiple picking aisles which significantly reduces the storage area required, or alternatively doubles the storage capacity in the same size area. It is comprised of conventional pallet or cantilever racking mounted on steel frame trolleys which run on imbedded rails in the floor. A control unit operates the mobile and numerous standard safety features complete the solution. Each installation is custom made, so it is tailored to your individual needs and available space.